^ 李语强; 伏红林; 李荣旺; 等. 云南天文台月球激光测距研究与实验. 中国激光. 2019, 46 (1): 0104004. ^ McDonald, Kim. 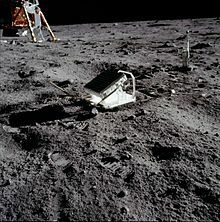 UC San Diego Physicists Locate Long Lost Soviet Reflector on Moon. UCSD. April 26, 2010 [27 April 2010]. ^ 8.0 8.1 8.2 8.3 James G. Williams and Jean O. Dickey. Lunar Geophysics, Geodesy, and Dynamics (PDF). ilrs.gsfc.nasa.gov. [2008-05-04]. 13th International Workshop on Laser Ranging, October 7–11, 2002, Washington, D. C.
^ It’s Not Just The Astronauts That Are Getting Older. Universe Today. March 10, 2010 [10 March 2010]. （原始内容存档于2010年3月13日）. 2002 article about "UW researcher plans project to pin down moon's distance from Earth"